Witness the Beautiful Fall Scenery of the Adirondacks! A four-seasons resort in the beautiful town of Lake Placid, the Mirror Lake Inn overlooks the lake of the same name and the high peaks of the Adirondack Mountains. The main building houses a lobby, spa, pool, the main restaurant, and a small assortment of guest rooms. In total you'll find seven buildings, 100 guest rooms, 31 suites, and three restaurants on the premises. The scenery is absolutely breathtaking in the fall, as you'll get to witness the trees that line the lake reveal their autumn colors. 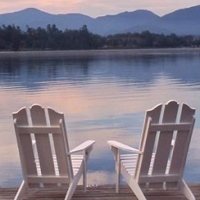 The Mirror Lake Inn is perfect for families and couples looking to get a feeling of the Adirondack camping experience. Browse through the website and take advantage of one of the inn's affordable vacation packages.